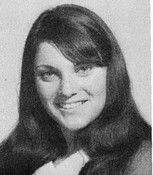 Classmate Dawn McIntire passed away December 7, 2017 in Las Vegas, NV at the age of 67. According to her daughter, Joy McIntire, Dawn moved to Las Vegas in the early 1980's, attended school and worked there, but became diabled in the late 1990's. Dawn got me and Deb Manning a job at the Andex Co. as a telephone solicitor years ago. I can still remember the spill we gave. We were in lil cubicals and could hear eachother. We would get the giggles and have to hang up on the people. I think we got fired !! But it WAS a memory I will never forget ! I also remember she was unhappy growing up....how did she die and was she ever married ? Dawn helped Cindy Haslett and myself get our first jobs working as telephone solicitors (telemarketers today) at a company where she was working. We sat in little cubicles next to each other and could hear each other talking and giving our speeches. Cindy and I got to laughing so hard I think we almost got Dawn fired. I don't think Cindy and me lasted more that a day, but something I'll never forget. I know she is finally at peace. Condolences and hugs to her daughter, Joy. So sorry for my comment on Dawns death back in 2009. I have since spoken with her and her daughter Joy. We have sent Christmas cards and a lil correspondnace off and on since then. I had just mailed her a letter earlier last week to check on her. She probably never got it... RIP my friend Dawn. So sorry for your loss Joy. Click here to see Dawn's last Profile entry.